Awaken your passion with Ralph Lauren Midnight Romance. Filled in a lovely, attractive package it has sweet invigorating smell. Infused with Peony, Raspberry, Vanilla and Ambrox the smell stays for long hours. It gives you gorgeous, seductive warmth. 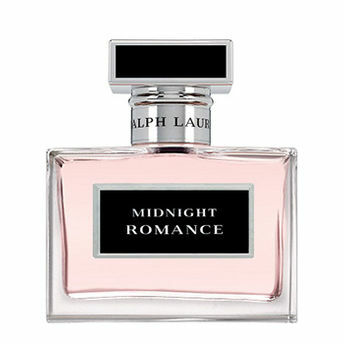 Re-energize your love with Ralph Lauren Midnight Romance. The Price : If it's too cheap or hugely discounted, it'sthere's a high probability it's a fake. The Place : Buy your favorite perfume only from authorized and licensed retailers who clearly state this. The Serial Number : Look for control numbers, batch number or the serial number. The serial number should match on the bottle and box. Quality of Package : Note its thickness, clarity and overall quality. Brittle or cloudy cellophane is a red flag. Spellings : An authentic designer perfume box with a spelling mistake or print error is clearly a fake. Color : Genuine fragrances are never murky or cloudy. If there are sediments or particles in the bottle, it's a fake. Container : Examine the quality of the fragrance bottle. Check for thickness, clarity, scratches, air bubbles or discoloration. Look at the bottle's cap : Check the color, shape and quality of the molding. Texture : Feel the fragrance between your fingers for excessive oiliness, a common sign of a fake perfume. Smell : Counterfeit fragrances are often made improperly. Normally, when perfume is attached to alcohol, it is placed in cans for few days to settle. Fakes often skip this step, so the composition is messy, flat and unpleasant. Explore the entire range of Perfumes (EDT & EDP) available on Nykaa. Shop more Ralph Lauren products here.You can browse through the complete world of Ralph Lauren Perfumes (EDT & EDP) .Alternatively, you can also find many more products from the Ralph Lauren Midnight Romance Eau De Parfum range.